Hackberry Canyon, located in the southwestern section of the 1.9 million acre Grand Staircase-Escalante National Monument in Utah, remains so enchantingly unspoiled it’s easy to forget you’re in the 21st century. And that’s the point of going there! While the hike is quite remote, the reward is a stunning narrow canyon, carved by a perennial stream, flanked by lush vegetation. If you go right now, there are also wildflowers. Most hikers spend only one day here, traveling just a few miles upstream and returning. But backpacking in, so you can explore the canyons and side canons at your leisure, is well worth a couple of days. The entire canyon is 20.5 miles long. Experienced technical climbers can even make it a through hike, exiting through a slot canyon at Round Valley Draw, which adds 1.5 miles to the trip, and naturally requires arranging for somebody with motor transport to be waiting at that end. At a trailhead elevation of approximately 5,000 feet, temperatures are usually ideal this time of year, and will be again in the fall. From the parking area and trailhead follow the worn path down about 30 yards into Cottonwood Wash and go right. 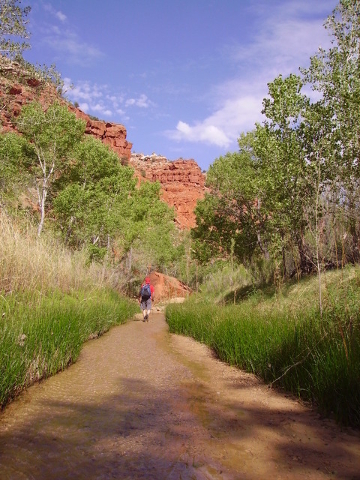 Then, almost immediately, you’ll head west out of the wash and into the mouth of Hackberry Canyon. The first quarter-mile of the canyon is usually dry unless there has been a recent rain. Thereafter, for the next 10 miles, you will find water – so much of it that you’ll often be walking in it, a few inches deep on a relatively sandy creek bottom. However, the upper canyon is dry, so backpackers must be sure to carry their own water. You’ll need to treat any water you take from the creek. 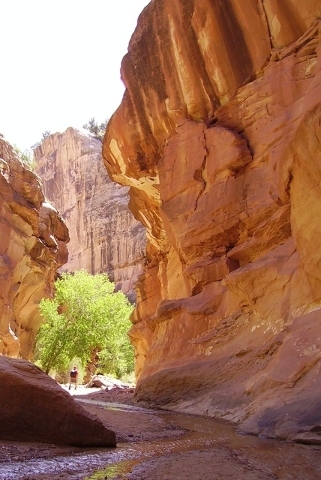 The canyon is especially narrow in the first part of the hike, its walls only about twenty feet apart in some places. Yet these bright orange and red cliffs, of Kayenta and Navajo sandstone, rise some 100 feet high. On the canyon floor grow cottonwoods and box elders, and wildflowers can be found throughout May. A good day trip destination might be Sam Pollock Arch located in a side canyon, which splits off to your left about 2.75 miles upstream from the trailhead. The arch was named for a rancher who grazed cattle here. This tributary has lots of boulders so be prepared for some rock scrambling. From the confluence of the two drainages, walk upstream about one-half mile, where you’ll find a dryfall blocking any easy passage. The best way around it is to backtrack about 100 yards and head up to the right. Once you’ve bypassed the dryfall, you can just drop back down in the canyon. Travel about one mile farther, and you’ll find the arch. Permits are not required for day hikes but you’ll need one for backpacking. You can self-permit at the trailhead, but since most of you will be traveling from Nevada and driving through Kanab, Utah, stop in at the monument’s visitor center there. Besides the camping permit, the visitor center can provide you with maps and up-to-date information on weather and road conditions, which can be important. Open seven days a week, its spring and summer hours are 8 a.m to 4:30 p.m. Find it at 745 E. Highway 89, Kanab, Utah. 435-644-1300, or www.blm.gov/ . Depending on the weather, deer flies might be found along the route. They bite and can be extremely annoying, so wear long pants and a shirt. Most important for this hike, wear water shoes, as you will get your feet wet, and keep your regular boots and dry socks in your pack for later use. Never enter any canyon, if rain threatens, as flash flooding is common. But it’s especially important to follow this rule in Hackberry Canyon for there are no quick escape routes from some parts of it. Deborah Wall is the author of “Base Camp Las Vegas, Hiking the Southwestern States,” “Great Hikes, A Cerca Country Guide,” and co-author of “Access For All, Touring the Southwest with Limited Mobility.” Wall can be reached at Deborabus@aol.com.